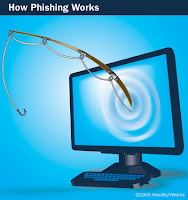 Phishing is an example of social engineering techniques used to fool users. Attempts to deal with the growing number of reported phishing incidents include legislation, user training, public awareness, and technical measures. Recent phishing attempts have targeted the customers of banks and online payment services. Social networking sites such as Orkut are also a target of phishing. Spoofed/Fraudulent e-mails are the most widely used tools to carry out the phishing attack. In most cases we get a fake e-mail that appears to have come from a Trusted Website . Here the hacker may request us to verify username & password by replaying to a given email address. Phishers have used images instead of text to make it harder for anti-phishing filters to detect text commonly used in phishing emails. This is the reason Gmail or Yahoo will disable the images by default for incoming mails. How does a phishing attack/scam look like? Example of a phishing e-mail message, including a deceptive URL address linking to a scam Web site. To make these phishing e-mail messages look even more legitimate, the scam artists may place a link in them that appears to go to the legitimate Web site (1), but it actually takes you to a phishing site (2) or possibly a pop-up window that looks exactly like the official site. These copycat sites are also called “spoofed” Web sites. Once you’re at one of these spoofed sites, you may send personal information to the hackers. How To Identify A Fraudulent E-mail? Legitimate sites will never ask you to send passwords, login names, Social Security numbers, or any other personal information through e-mail. Phishing e-mail messages are usually sent out in bulk andoften do not contain your first or last name. HTML-formatted messages can contain links or forms that you can fill out just as you’d fill out a form on a Web site. The links that you are urged to click may contain all or part of a real company’s name and are usually “masked,” meaning that the link you see does not take you to that address but somewhere different, usually a scam Web site. 1. Never assume that an email is valid based on the sender’s email address. A special Thanks to Srikanth for this information ,I hope you like this post. For further doubts and clarifications please pass your comments. How can we create a phising site.....????? how can i hack facebook account brother.plz reply me.where can i get facebook hacking software for free.plz advise me.